Personalize an anniversary card for your sweetie with Legacy Letters! 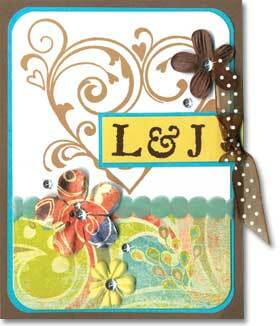 Stamp “L & J” using the Legacy Letters set with dark brown ink on a strip cut from a Lemon Notecard. Back with a Lagoon Notecard and trim. Stamp the Fancy Hearts image with creamy brown ink on a White Notecard. Add a pattern paper strip to the bottom and then velvet ribbon. Round the corners. Adhere to a piece from a Lagoon Notecard and then affix to a Chocolate Notecard. Add Art Flowers and Assorted Crystal Gemstones. This design also makes a great wedding card.